I wanted to quickly share some great tips for buying a new furnace. 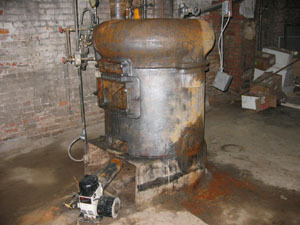 One in four furnaces in U.S. homes is more than 20 years old – and therefore well past its prime – according to the EPA. That means millions of homeowners may be in for a rude awakening this winter when the heat goes out and they’re facing an unexpected expense that can run thousands of dollars. To help home owners with the daunting task of buying a new furnace, Ken Ely, a home heating expert with Lennox – a leading manufacturer of air conditioning and heating systems, has offered these tips. Don’t panic! Consult the major furnace manufacturer websites and energystar.gov, which will provide an overview of the types of furnaces available and their varying degrees of energy efficiency. Also check out the Good Housekeeping Institute and Consumer Reports, which evaluate performance, costs, and long-term reliability of heating systems. Learn the lingo. A furnace’s AFUE, or annual fuel utilization efficiency, is the most important thing to know. The higher the AFUE, the more money you’ll save in the long run. New systems like the Lennox SLP98V gas furnace achieve up to 98.2% AFUE and can save more than $800 each year on utility bills, compared with an older furnace with a 65% AFUE rating. Consider your comfort. Today’s heating systems have a variety of new features that you should consider. For example, furnaces with a variable capacity operate like a car’s cruise control, automatically making adjustments as needed to allow for maximum comfort and fuel efficiency – saving energy and money. Others feature sound-absorbing material so you don’t hear every time the furnace cycles on and off. Go for a pro. Resist the temptation to go with whichever repairman can make it out to the house quickest. Instead, call upon a few different heating and cooling contractors who are affiliated with the major manufacturers you researched. These contractors should be well versed and trained on the furnaces you’re interested in. Cash in on special offers. Look for rebates on energy-efficient furnaces from the manufacturer and your local utility company. ENERGY STAR offers a handy rebate finder at www.energystar.gov/rebatefinder. And if you’re in the market for a new heating system right now, you may be able to take advantage of the $1,500 federal tax credit before it expires on Dec. 31. I’ve got a monster — 50’s house, kitchen water leak for 13 months!, mold mediation, the works. The furnace is a Lennox less than 5 years old. It appears to operate electrically — it automatically operates the AC system just fine, for example — but I can’t get the fan to turn on. Q: Should I just assume the entire furnace must be replaced? Or, should I try to just replace the fan/motor? PS: The (galvanized! )ductwork is corroded — small pockmark kind of things — kind of whitish in color. Is this a problem, other than the way it looks? I intend to paint them. You really need to get a qualified HVAC contractor there to evaluate it. It really depends on if water damaged the circuit boards and electronic components. Those components can be extremely expensive. I am considering replacing a 35 year old FHA oil burner in my 1200 square-foot single level home in Wolfeboro. I am also considering converting to propane since I have a Rinnai heater on my front porch and I cook with propane. I am considering a high efficiency Lennox, but I have been led to believe, that high efficiency furnaces needed to exist in a warmer basement, due to exhaust venting possibly freezing up. I do not heat my uninsulated basement, however the ambient year around temperature is 50 to 55° And possibly warmer due to residual heat from the FHA ductwork. Basement is warmer in the summer months of course. Paul – I’ve never heard of this issue before but most of my experience with these furnaces is new construction. Having said that 50-55 deg is about normal for all unheated basements in the winter. I wouldn’t give that a 2nd thought if it were me. Good luck!